A breakfast pizza for on the go. In a stand mixer bowl, combine flour and salt using a dough hook. In a 2-cup measuring cup, combine water, vegetable oil, honey and yeast; add to flour mixture. Mix on medium speed for 8 minutes, until a ball forms and the bowl is clean. Cover dough with plastic wrap and allow dough to rest for 10 minutes. In a medium sauté pan, heat the vegetable oil over medium heat. Sauté sausage until browned and cooked through, about 8 minutes. Drain and reserve. Sauté the spinach in batches until wilted, about 5 minutes. Set aside to cool. Divide the dough into 24 pieces. 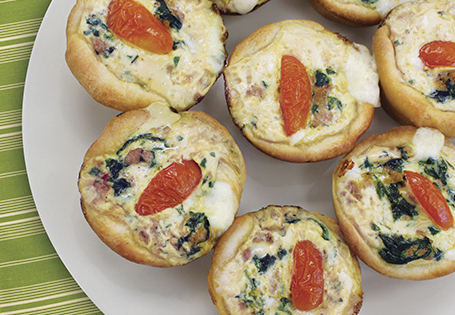 Place pizza dough into muffin cups, spread it up the sides to form a crust. Evenly distribute cheese among muffin cups. In a medium bowl, lightly beat the eggs. Add the sausage, spinach and half & half. Stir until well blended. Season with salt and pepper. Place 1 1/2 tablespoons of the egg mixture into each muffin cup. Top with 1 cherry tomato per cup and bake for 15 minutes or until crust is golden and filling is set. If necessary, cover with foil to prevent over-browning.